Deus Ex is widely regarded as one of the best PC games ever made. Its critical and commercial success heralded the mainstream arrival of a genre called Immersive Simulation, or ImSim. It’s not hyperbole to say it was groundbreaking at the time of its release, and modern-day developers still draw inspiration from it. Last year, Deus Ex made it to the 23rd spot on PC Gamer’s Best PC Games of All Time feature. Though gaming journalism thrives on gaming in the current era, the merits of Deus Ex are still worth contemplating in a five-part series. So what makes this game so special? 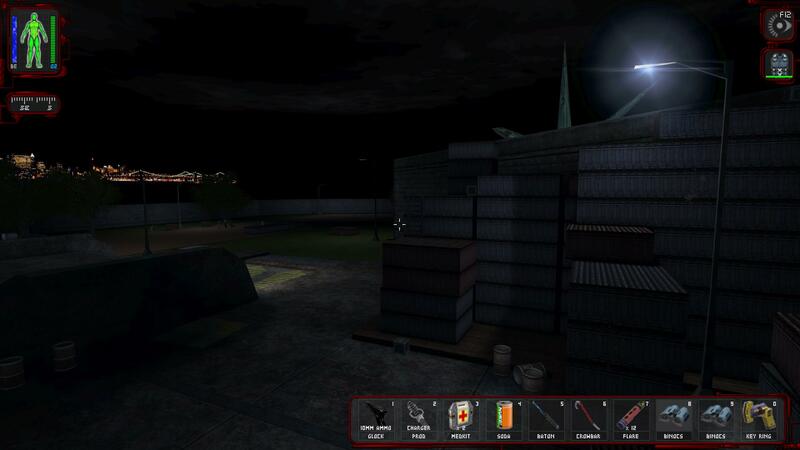 The gameplay takes place from a first-person perspective and combines elements of action and shooting, stealth, role-playing games, and character-rich dialog trees. In short, it aimed to be a game where any style of play was a viable option. Enemy outpost ahead? You can mount a frontal assault with guns blazing, or you can sneak around to find the back door. Talk to a few civilians nearby, and they might even offer other alternatives. It’s possible for two people to play the same game and have wildly variable experiences. The game’s story paints a bleak picture of the near future. The world population is at critical levels, and to make matters worse there’s a raging plague known as Gray Death spiraling out of control. Cure for this plague is in short supply, and most of what’s available is handed out to those with money or status. This inequality causes tension between socioeconomic classes and threatens to boil over into violent conflict. Fringe groups have started stealing shipments of medicine and redistributing it to the common people. Cybernetic augmentation of humans is becoming more and more common, with many soldiers receiving upgrades that leave them looking like humanoid robots. Bionic implants have just taken a major leap forward, leaving its subjects more human-looking while granting greater augmented capabilities. Enter JC Denton, the second man to receive these new abilities and the character you control throughout the game. JC works for the United Nations Anti-Terrorist Coalition, UNATCO. They thrust him into the middle of this mess to find the missing medicine and bridge the gap between common man and the future of augmented humankind. 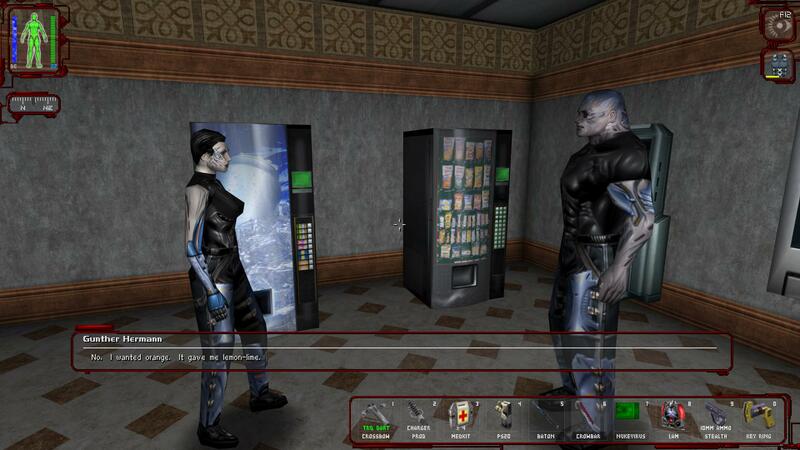 Even augmented humanoid killing machines have problems with vending machines. In spite of an entire laundry list of enticing features, I’ve never played Deus Ex through to completion. As best as I can figure, the farthest I’ve ever made it in the game is to Hong Kong, which is about a third of the way through. I don’t know that there’s been any one thing that causes me to quit. It’s not like I encountered a difficult stretch of gameplay and gave up because it ceased to be fun. The extremely sad part is that I’ve started and quit playing the game no fewer than four separate times. There’s a lot here that I should absolutely fall in love with, but for some reason Deus Ex has remained one of the biggest titles on my shameful list of unfinished games. Not anymore. Here and now, I pledge to start and finish Deus Ex for the first time ever. Why? Two reasons, primarily. First, I just can’t stand the idea that I’ve let this game go uncompleted for so long. I know I’ve enjoyed what I’ve played, I just wind up dropping it for some reason. This time I’ve got to see it through. Second, since Deus Ex is such an influential title in gaming history, it’d be a horrendous oversight not to be familiar with it. In order to recognize its influence, I’ve got to know what it accomplished on its own. There are quite a few games in my library that owe some part of their existence to Deus Ex; Bioshock, Stalker: Call of Pripyat, Dishonored, and Prey, to name a few. Yeah, there’s not much you can do to hide 18-year-old video game graphics here. Since Deus Ex is nearly eighteen years old, it has a few rough edges not even the thickest rose-colored glasses of nostalgia can smooth over. 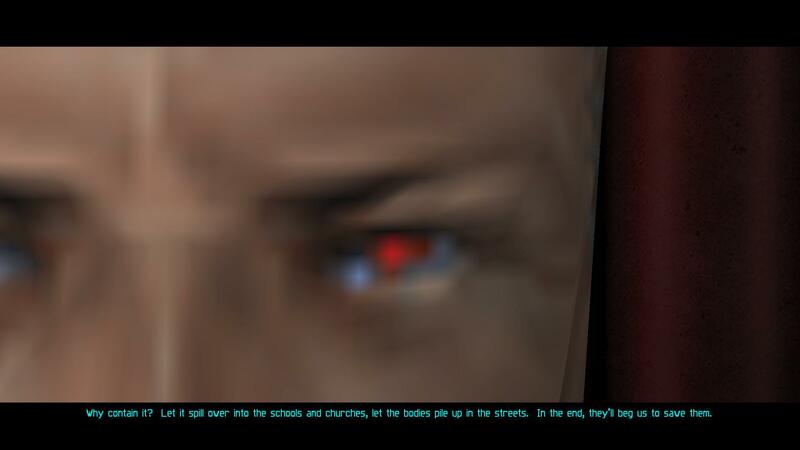 That’s why I’m going to play a modded version called Give Me Deus Ex, or GMDX for short. From all reports, it manages to leave most of the lore, layout, and level design of the original game unchanged. It adds enhanced graphics by way of high-resolution textures, as well as changes to the user interface. Enemies are more intelligent, behaving a bit more lifelike than the original design. Plus there are dozens of changes and tweaks to gameplay mechanics that I won’t list here. In short, it seems to be a mod that is faithful to the original design philosophy of the original game. As I write this I’ve had a chance to play the first two hours in the mod, and I think I can safely say that it is true to the spirit of Deus Ex. It makes a lot of cool tweaks and improvements without feeling like a rewrite of the game everyone knows and loves. 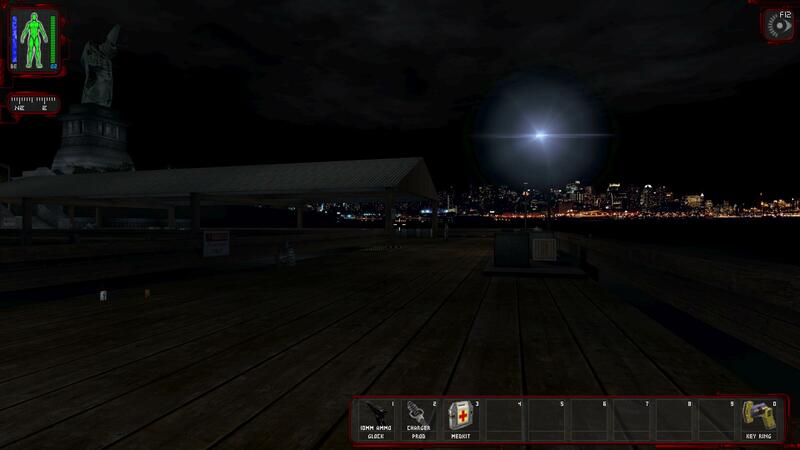 The opening mission of the game is one that perfectly illustrates the vision of Deus Ex. 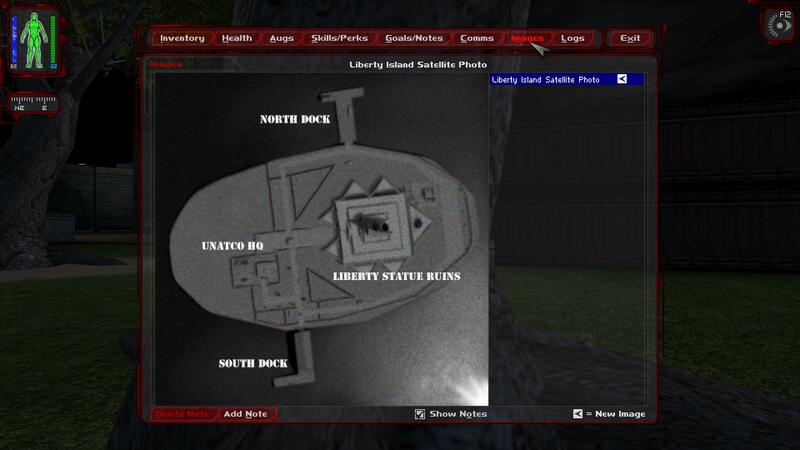 Diverted from their escape plans after stealing a cache of anti-plague vaccine, a group of rebels has taken over Liberty Island. Yes, the same island which the Statue of Liberty calls home. They’ve taken a fellow UNATCO agent hostage and are holding him the base of the statue. The terrorist leader is hiding out in the top of the statue, waiting and hoping for a chance to escape. Your brother, a fellow augmented UNATCO agent, informs you that you’re working the mission solo. Someone “high up” wants to see how you handle the situation. It’s your job to capture or kill the rebel leader. You do have at least two choices when it comes to handling the situation: Either you can use brute force or try to sneak around undetected. The design of this level forces a certain amount of discretion, no matter what your intent is. The area around the statue is flat and open, so it’s difficult to engage with enemy soldiers without alerting their squad mates. The South Dock, where it all begins. Since ammo is scarce and I didn’t have any ranged weapons worth using, I decided to clear the island in a non-lethal manner. 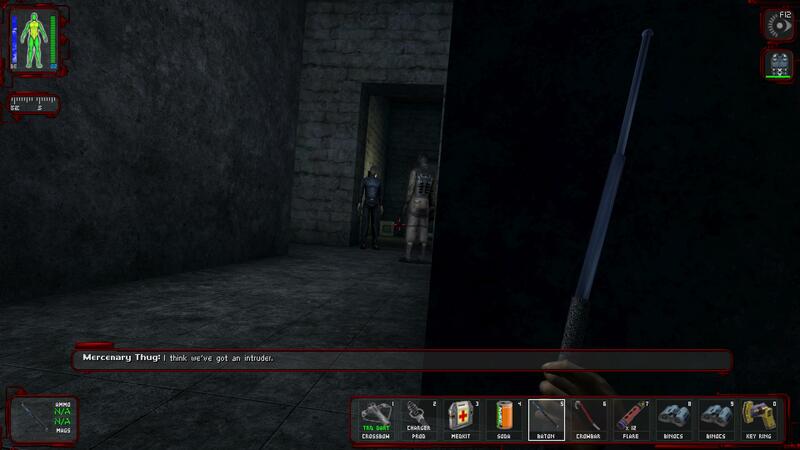 At first, I thought I’d sneak up on enemy soldiers one by one and knock them unconscious with my handy baton. That worked extremely well for the first soldier. The second one was, apparently, alerted by the sound the baton makes when it extends and turned around to face me before I could land a blow on the back of his head. He fired a shot or two as I started whacking him in the face with my baton. It took about four or five blows, but I eventually knocked him over. No time to celebrate victory though, as the gunfire wounded me and alerted more enemies to my location. Though I could outrun the pack for a few brief moments, the next time I turned around I saw six enemy soldiers firing pistols and machine guns at me. Time to reload and try something different. The fact that I had this much trouble so early in the game speaks volumes about the improvements GMDX makes to enemy AI. While any stealth game is about exploiting the AI and game design to an extent, it’s nice to feel like there’s a real challenge to overcome here. It didn’t take me too long to adjust my tactics and make some progress in infiltrating the statue. There was a brief moment near the cargo yard on the east side of the island where I thought it was all over. I had worked my way clockwise around the island and was preparing to climb up a pile of crates. An enemy turned the corner, saw me, and started sprinting in my direction. I heard a burst of gunfire and was momentarily puzzled as to why my health stats weren’t going down. Then I noticed impact marks behind the terrorist. A lone UNATCO security bot, patrolling near the north dock, had come in range of the terrorist and opened fire; it saved my rear end. For a brief moment I considered luring the other nearby terrorists into the firing range of the security bot, but decided that would go against the pacifist position I’d adopted for this mission. After a missed jump or two, I’d safely navigated the piles of cargo containers and made it onto the second major level of the statue foundation. Near the end of the mission, I found myself stuck in a predicament about three-quarters of the way up the statue. On my way up I’d somehow managed to sneak past two soldiers who were hanging out near a stairwell. They should have seen me, I’m pretty sure one of them was suspicious, but neither one came after me. I climbed up a stairway past the two of them, walked down another hallway, and then climbed another set of stairs. Here’s where the problem became apparent. There were two more mercenaries at the top of these stairs, and there was no possible way to sneak past them. It was easy to take the first one of them down with a well-placed tranquilizer dart from my mini crossbow. But as soon as the first enemy dropped, the other immediately became alerted to my presence and started shooting at me. Dealing with one angry soldier isn’t a problem, but the sound of gunfire alerted the two soldiers below me. By the time I’d downed the second soldier on the upper level, the two from the lower level came to spell my doom. Eventually I realized I had stolen a gas mine from a supply room below. I planted that in the hallway between the two groups of enemies. This time when the lower set of guards was alerted to my presence, they walked through the hallway and triggered the gas mine. The explosion and ensuing gas cloud incapacitated them allowing me to leisurely send a tranquilizer dart in their direction. Hard part done, I made it to the top of the statue where the terrorist leader had taken up refuge. He told me that I was too late to recover their shipment; that it was already on the way to the mainland. Primary mission accomplished, you have the option: let him go, or shoot him on the spot. Owing to my non-lethal commitment for the mission, I let him go to be scum for another day. After this are another two missions I won’t go into much detail about. UNATCO HQ serves to fill in some back story and introduce you to more of the cast members of the game. You’ll certainly read more about them in future posts. Assault on Castle Clinton is the next one that, while fun, doesn’t resonate with me as much as other missions in the game. I think part of that is because after assaulting the ruined Statue of Liberty, it’s hard for me to be excited about a mission centered around a big brown circle. Worth playing and kind of fun? Yes. Fun to read about? Not so much. Next up – Hell’s Kitchen! Thanks so much for starting this up, motivating me to do the same, and try out the GMDX mod. It’s absolutely brutal (playing on Realistic), and giving me a run for my money especially when I grew to rely on knowing all of the exploits. There’s a reason the mod warns you about starting on Realistic if you’ve never done GMDX before. You also reminded me that I never dug deep enough into STALKER: Call of Pripyat. Since that’s the sequel to Shadow of Chernobyl, I’ll probably load that up first. Not sure if I’ll stick with either, but they’ll at least be installed on my computer, looking at me.